Sasaki Time: Giveaway: $25 Gift Card to Build A Bear! 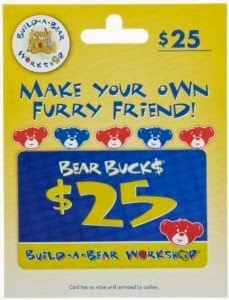 Giveaway: $25 Gift Card to Build A Bear! Win a $25 gift card to Build A Bear! I have one that someone made for me but I'd love my boys to make one themself! I don't have a Build A Bear but I took my niece to get one. She loves hers! I love build a bear, it makes such great gifts for my nieces and nephews. I lo e taking them so they can build their own. My daughters bday is Feb 13 and we took her last year to make her first build a bear(which she choose a giraffe not a bear) so this would be awesome for her! My daughter has a Build a Bear but my son and I do not, I would love to bring my son and have him choose a new friend! My daughter loves her Elsa bear from Santa! We'd like to make a bear for her baby sister. My son has 6 of them. He has toothless, Alvin, a dog, superman bear, spiderman bear, and Captain America bear. now he wants the batman bear and a ninja turtle one. No, we haven't done this before. No, I had one years ago. I would love to take my grand-daughter to make her first build-a-bear! I have a build a bear bunny. Yes I do! I have 2, and my daughters have a few as well. Giveaway: Disneyland Dole Whip Air Freshener! Disney's Into The Woods - "Stage To Screen"